Tuesday's Tip - Label Those Tags! Whenever you use tagging (see the numbered boxes in the image 1-9 - those are tags), make sure you go to TOOLS > ADVANCED TAGGING and label the tags so that you know what is on what tag. It is VERY easy to forget what you have tagged especially if you have multiple tags in play. If you want to see what a particular tag means, you don't have to go back to this screen, you can simply hover over that tag number in the Family View or Pedigree View. In the example below, Tag 1 is used to help find some of Geoff's best ancestors! Join us and Peggy Clemens Lauritzen, AG for the live webinar Wednesday, March 1, 2017 at 2pm Eastern U.S. Register today to reserve your virtual seat. Registration is free but space is limited to the first 1,000 people to join that day. Before joining, please visit www.java.com to ensure you have the latest version of Java which our webinar software requires. When you join, if you receive a message that the webinar is full, you know we've reached the 1,000 limit, so we invite you to view the recording which should be published to the webinar archives within an hour or two of the event's conclusion. 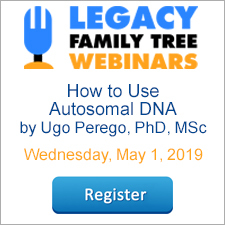 The recording of Wednesday's webinar, "Finding Missing Persons with DNA Testing" by Diahan Southard is now available to view at www.FamilyTreeWebinars.com for free for a limited time. If you could not make it to the live event or just want to watch it again, the 1 hour 31 minute recording of "Finding Missing Persons with DNA Testing" is now available to view in our webinar library for free for a limited time. Or watch it at your convenience with an annual or monthly webinar membership. If you are searching for an ancestor who fought in World War One, the Red Cross Military Files are a valuable resource. During the war the Red Cross provided vital services for prisoners of war, and wounded or missing soldiers. Hundreds of thousands of volunteers were engaged in the war effort under the Red Cross supervision and often this resulted in records being kept of the volunteers and soldiers. Not all Red Cross records in all countries have survived and in some countries the records were never made. However some countries’ files have been digitized and are available online. The U.K. saw approximately 90,000 Red Cross volunteers working at home and abroad between 1914 and 1918. They contributed their services as nurses and air raid wardens. Volunteers transported the wounded, organized clothing for hospitalized soldiers, set up auxilliary hospitals, created convalescent homes, and assisted in other essential roles. VADs (Volunteer Aid Detachments) provided rest stations for arriving wounded soldiers and helped families find information on missing or wounded soldiers. The mystery author Agatha Christie is found in these records. The Australian Red Cross has provided a searchable database of wounded and missing soldiers. The Red Cross files consist of approximately 32,000 individual case files of Australian personnel reported as wounded or missing during the First World War. The Red Cross Bureau's Searchers' report. Eyewitness accounts by men who knew the soldier concerned or statements by men who served in the same unit or the same action as that soldier. These statements may include such information as: the circumstances of the death or wounding; a physical description of the soldier and the place of burial. Letters sent to the Bureau by relatives or friends. The Bureau's replies to enquiries. Correspondence between the Bureau and the wounded or missing man. Very few records for Canadian Red Cross volunteers have survived. Millions of women worked as volunteer knitters and sewers, or packed up parcels for Prisoners of War. They visited wounded soldiers, wrote letters and also acted as drivers during both world wars. However, Red Cross records of volunteers in Canada during World War One have long since been destroyed and in many cases never existed. Service to the American Armed Forces and their families. Service to Allied military forces, particularly the French. Limited service to American and Allied prisoners of war. Service to civilian victims of war, with an emphasis on the children of Europe. The ARC was involved in the production of garments, surgical dressings and other medical supplies, comfort kits, and additional items for the benefit of American and Allied soldiers and sailors and destitute civilians in war-torn countries. The archives of the International Prisoners of War Agency (IPWA) were created during the early days of the war. Seven million soldiers were taken prisoner, many civilians were interned on enemy soil and millions more endured military occupation by the enemy or fled from combat zones and occupied territories. These files were submitted by the International Committee of the Red Cross (ICRC). The recording of tonight's webinar, "Weaving DNA Test Results into a Proof Argument" by Karen Stanbary, CG is now available to view at www.FamilyTreeWebinars.com/BCG for free for a limited time. If you could not make it to the live event or just want to watch it again, the 1 hour 24 minute recording of "Weaving DNA Test Results into a Proof Argument" is now available to view in our webinar library for free for a limited time. Or watch it at your convenience with an annual or monthly webinar membership. 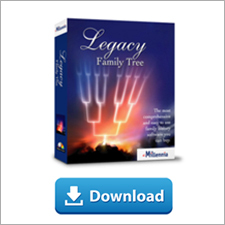 There are some "secret" popup bars on the Family View of Legacy Family Tree. If you put your mouse cursor over certain areas this secret bar will pop up and you can then click it and it will do something. Most people find the one that allows you to scroll through a person's marriages on their own but there are more. Below are screenshots of secret bars that may be new to you. Look for the RED arrow below in each photo to identify the location of the secret bar. The recording of today's webinar, "Be Your Own Digital Archivist: Preserve Your Research" by Cyndi Ingle is now available to view at www.FamilyTreeWebinars.com for free for a limited time. If you could not make it to the live event or just want to watch it again, the 1 hour 46 minute recording of "Be Your Own Digital Archivist: Preserve Your Research" PLUS the after-webinar party is now available to view in our webinar library for free for a limited time. Or watch it at your convenience with an annual or monthly webinar membership. Use webinar coupon code digital10 for 10% off anything in our online store including Legacy software, Legacy QuickGuides, webinar memberships and more. Coupon good through Monday, February 20, 2017. Join us and Cyndi Ingle for the live webinar Wednesday, February 15, 2017 at 2pm Eastern U.S. Register today to reserve your virtual seat. Registration is free but space is limited to the first 1,000 people to join that day. Before joining, please visit www.java.com to ensure you have the latest version of Java which our webinar software requires. When you join, if you receive a message that the webinar is full, you know we've reached the 1,000 limit, so we invite you to view the recording which should be published to the webinar archives within an hour or two of the event's conclusion. Cyndi is the creator, owner and "webmaster" of the award-winning web site Cyndi's List of Genealogy Sites on the Internet, www.CyndisList.com, a categorized index to more than 335,000 online resources. In its first three years, Cyndi's List was three times voted the best genealogy site on the World Wide Web. It helps millions of visitors worldwide each month and has been featured in the media and diverse publications, including ABC News, NBC News, USA Today, Time, Newsweek, Parade Magazine, Wired, Family Tree Magazine, Family Chronicle, and Internet Genealogy magazines. Cyndi has been interviewed for many television and radio broadcasts including ABC News, NBC News, the BBC, and National Public Radio. She has also participated in the Ancestors II television series on PBS. Cyndi, a genealogist for more than 35 years, is a past-member of the board of directors for the National Genealogical Society. Cyndi is an internationally known guest lecturer for various genealogical society meetings and seminars (http://www.CyndisList.com/speaking-calendar/). She has lectured for the Salt Lake Institute of Genealogy, GENTECH, Brigham Young University, the Federation of Genealogical Societies, the National Genealogical Society, the Washington Library Association, the Florida Library Association, the American Library Association and numerous local genealogical societies in the United States, Canada and the United Kingdom. Cyndi has authored numerous articles and three books. Before her life on the Internet, Cyndi worked as an international banker specializing in foreign exchange and computer networks. Cyndi, her son, Evan, and three Boston Terriers live in Edgewood, Washington.